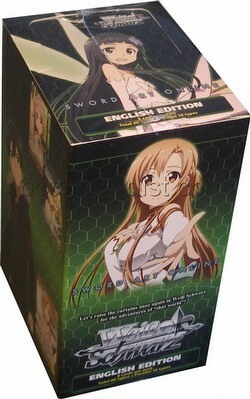 Each Weiss Schwarz Sword Art Online Volume 2 booster box includes 20 packs. Three of six different promo cards will be included in each box as a bonus. Exclusive SP Gold Foil/Hot Stamped signed cards from the original Japaense voice actresses are randomly inserted - Haruka Tomatsu (Asuna), Rina Hidaka (Silica), Ayahi Takagaki (Lisbeth), Kanae Ito (Yui), Ayana Taketatsu (Leafa), and Yoshitsugu Matsuoka (Kirito). There are 80 different cards in the set (8 RR, 16 R, 24 U, 24 C, 8 CX, and 18 Parallel - 6 SP, 4 RRR, & 8 SR).